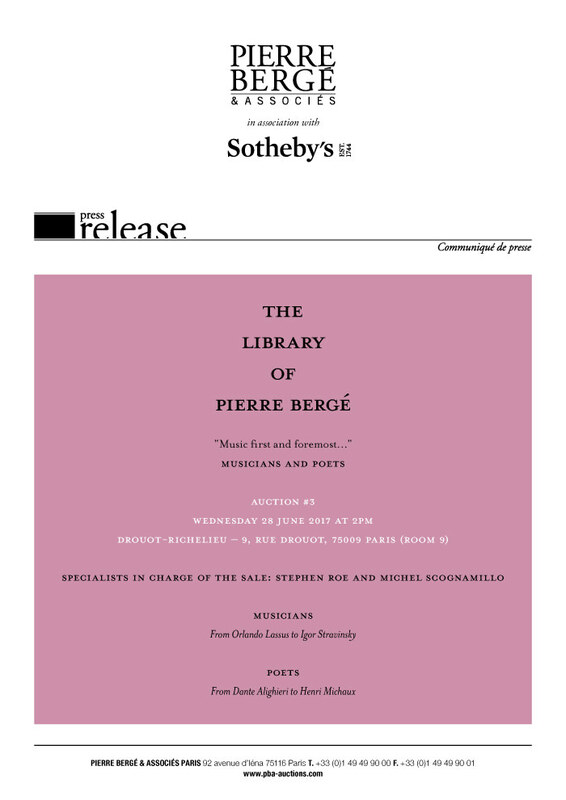 Pierre Bergé & Associés, in association wit h Sotheby’s, will offer at auction the third part of Pierre Bergé’s library, dedicated to music and poetry. This sale forms a lyrical interlude between the magnificent selection in the first sale and the romantic literature of the second. The third sale leads us to the very heart of Pierre Bergé’s world, illustrating two fields particularly dear to him: music and opera (omnipresent in the private and public life of the man who is friends with Philippe Jordan, Renaud Capuçon and Bob Wilson, was the former director of the Théâtre de l’Athénée-Louis Jouvet and President of the Opéra Bastille, and is a regular at the Salzburg and Bayreuth festivals) and poetry, which he always cultivated passionately as the friend of Jean Cocteau and worshipper of Louise Labé.